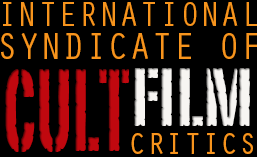 One of our stated aims here at the ISCFC is to find the very bottom of the cinematic barrel. I think we might already have reached it (“Things”, “One More Time” and “After Last Season” are as miserable as it gets, I reckon), but it doesn’t hurt to continue the search, and to that end we come to Donald Jackson. We’ve met him before, with “The Roller Blade Seven”, one of those movies that’s in the conversation for worst of all time – but that’s more than a decade in the future, and we wanted to start at the beginning. There’s a story behind “Demon Lover” that makes it difficult to hate, as well – Jackson kept himself sane while working on a factory production line by talking trashy B-movies with his friend Jerry Younkins. One day, they got a payout from work due to an industrial accident (Younkins had several fingers chopped off), and decided to spend it to make their own movie. Now, that’s dedication! Before we get going, it’s possible you’ve heard of “Demon Lover” without actually having seen it. It’s the subject of a fairly famous documentary, “Demon Lover Diary”, created by Joel DeMott and Jeff Kreines (Kreines was hired to work on the movie, his partner DeMott saw an opportunity). You know that story I just told? Turns out it might not have been as much of an accident as I originally thought, and that Jackson, Younkins and pretty much everyone who worked on the movie were all raging assholes – the doc sounds fascinating and I’ll try and track it down. DeMott and Kreines would go on to win a Sundance Festival Grand Prize with “Seventeen”, a few years later, and as of the last time I checked are still making films and living off the proceeds of some film-based inventions they created. Jackson, on the other hand, would go on to “Hell Comes To Frogtown”, a long-running partnership with Scott Shaw and an almost uninterrupted stream of the worst movies ever. The movie itself kicks off at a 70s hipster party. A guy who looks like Frank Zappa is trying to hit on all the women, a guy who’s the archetype for every shrill nerd from every show ever is trying to keep the event on a nice even track, and a few couples alternate between kissing and philosophical discussion. They’re waiting for a fellow called Laval, who looks like the sloppy lead singer of a 70s jam-rock band, and when he comes down he tries to round everyone up for a good old fashioned bit of demon-worship. Laval wants some women to get naked so he can do real black magic, but mercifully most of the women refuse and the party breaks up. The party-goers are all Occult Studies students at college, who started hanging out with Laval because he seemed to know a lot, but they seem…not exactly indifferent, but curiously casual at the prospect of getting on the wrong side of someone who appears to have real power. This entire first scene is a handy indicator for what’s to come, and even contains hints of the rest of Jackson’s career. The conversations and interactions between the group of friends feels incredibly natural, not in the sense of they’re all good actors, but in the sense of this feeling like a documentary. While a few of them are trying to act, and fail miserably, the bulk of the cast just feel like they weren’t putting on a performance at all, and it’s actually pretty interesting. There’s also a really strange cameo, the Professor of occult studies who the policeman hassles at a party: one Gunnar Hansen, whose sole movie credit to that point was three years earlier, as Leatherface in “Texas Chainsaw Massacre” (to be fair, that’s a good single credit to have). How did a couple of complete novices from Michigan get Gunnar Hansen’s number? There’s a scene in the documentary, apparently, where they go to right-wing rocker Ted Nugent’s house to borrow some firearms and explosives for the finale – how the hell did they know Nugent? The plot thickens. So, Laval makes a sacrifice, and gets some real black magic powers, then starts getting revenge on the women who refused to get naked for him. The guys, trying to figure out a way to beat him, meet in desolate, overgrown woodland, there’s a cop with some excellent investigative skills, there’s a scene where Laval takes some martial arts lesson (so it’s slightly more believable when he beats up an entire bar full of people later), and there’s a pretty wild, gore drenched finale. And there is a demon in it, but his effect is absolute garbage so they sensibly keep him in the shadows. No “demon lover”, though, as far as I can tell. Shame! Laval is more a “demon enthusiast”. What I was most surprised by is how, almost despite itself, “Demon Lover” managed to generate some real creepy atmosphere. The sound is cheesy, with the layered voices and moans, but cheesy works sometimes; and the fuzzy washed out look of the image contributes significantly to that 70s drive-in-horror feel. It’s so amateurish from top to bottom, with so many odd choices and camera placements and acting choices, that…well, one could say that all “normal” movies look the same, while all insane low-budget regional horror B-movies are weird in their own special way. I couldn’t recommend it – no sane person would – but it’s certainly interesting, and nicely short. I’m looking forward to digging further into his filmography, and telling the tale of him and Scott Shaw, when the time comes. This entry was posted in Reviews and tagged Donald G Jackson, regional horror. Bookmark the permalink.